Many people take on the role of family caregiver involuntarily, even grandchildren. Caring for a grandparent has its own set of challenges, in addition to the typical caregiver tasks. Take a look at some of the unique challenges of providing care for a senior grandparent and ways to address each issue. If your grandparent needs your help, you may have to let go of some commitments until you’ve adjusted to the caregiver role. For young caregivers enrolled in college, this could mean dropping to part-time hours or taking at least one semester off. Not being able to focus on educational goals could have an emotional impact, causing you to react negatively toward your peers, family members, and grandparent. Look into ways to simplify your caregiving duties, such as hiring a professional caregiver. You can also sign up for online college courses. These options allow you to care for your grandparent while continuing with your studies. If you’re the primary caregiver for a senior loved one in Rhode Island, respite care is available when you need time away from your important caregiving duties. At Home Care Assistance, our respite caregivers are available 24 hours a day, 7 days a week to help your loved one manage everyday tasks in the comfort of home while you have the chance to take a much-needed break. It’s common for young caregivers to become so involved in their grandparent’s care that they don’t get the balance and separation they need. 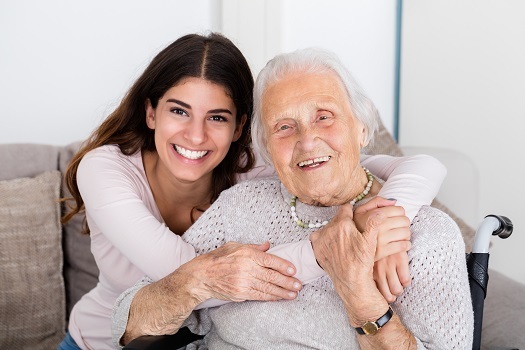 It’s necessary to take time away from your grandparent, regardless if you reach out to other family members for assistance or use home care services, so you can work on your personal development. Remember personal growth should be mindful and deliberate. Although it may be difficult to find balance from your caregiving duties, it’s not impossible. If you’re the primary family caregiver for an elderly loved one and need additional assistance providing high-quality senior home care, Rhode Island Home Care Assistance can help. We are a leading home care agency committed to changing the way seniors age. Young caregivers often hear they lack the knowledge necessary to care for a grandparent. As a result, they focus too much on failing instead of celebrating what they’ve achieved or learning more as they go. Lack of confidence could make you feel self-conscious and defensive. Although you have the energy to care for an elderly grandparent, the shame, embarrassment, and doubt you experience could become emotionally draining. To address these issues, learn as much as you can about your grandparent’s care needs. You don’t have to enroll in college courses, but doing some research could boost your confidence as you care for your grandparent. Seeing your friends going on fun outings while you’re at home caring for your grandparent may be difficult to adjust to. Constantly canceling plans with your friends could lead to fewer invites in the future. As a result, you could become isolated. However, you need to find time to socialize with people your own age to reduce the risk of depression and caregiver burnout. Taking time to do things you like doesn’t make you a bad caregiver. It’s okay to set time aside each week to go shopping with friends, take a weekend getaway, or go on a date with a special friend. These are things that can help you maintain good mental and emotional health. Caring for a senior loved one can be challenging for families who don’t have expertise or professional training in home care, but this challenge doesn’t have to be faced alone. Family caregivers can turn to Rhode Island Home Care Assistance for the help they need. We provide high-quality live-in and respite care as well as comprehensive Alzheimer’s, dementia, stroke, and Parkinson’s care. To create a comprehensive in-home care plan for your aging parent, give us a call at (401) 284-0979 today.